In time, you may find your cat and kitten become good friends. Introduce your new kitten to the existing cat slowly. Set up one room in your home for the new kitten. To prevent jealousy, choose a room your cat doesn't spend much time in. Place the litter box in one corner, food and water in another, and provide toys for entertainment. Gradually allow the kitten out, supervised, for short periods, until you feel comfortable leaving the cat and kitten out together when you aren't around. Spend one-on-one time with your existing cat to prevent jealousy. He shouldn't feel that he has to compete with the new addition for your attention. Kittens are used to sharing resources and won't see any difference. Set up multiple litter boxes in the home. Don't expect the new kitten to want, or be permitted, to share your cat's existing box. Keep the box set up in the room you initially set up for the kitten. You may want to add an additional box somewhere else in the house, to reduce the odds of one or both deciding they don't want to use the available boxes. Feed and water your cat and kitten in separate areas. Once your kitten graduates from his own room, it may be tempting to move the food dish to the same spot where you feed your other cat, but this can cause hostility and aggression. If you want to keep both dishes near the food storage area, place them far enough apart that each can eat without the other feeling threatened. Stay up to date on veterinary care. Kittens require a series of vaccinations, and adult cats require at least an annual trip to the vet for boosters and a general check-up. Spay or neuter your cat and kitten. 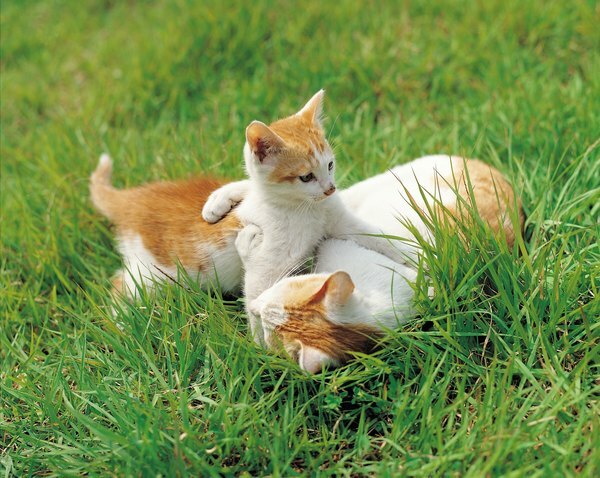 Having all of the felines in your home spayed and neutered will minimize spraying, territorial behavior and reduce the risk of many health problems. What Percentage of Kittens Are Adopted?